Although we all strive to exercise and eat healthy diets, some of us are plagued by “stubborn” fat. As the name implies, it can seem impossible to lose certain areas of fat, such as those “muffin tops”, love handles, and bra rolls. Coolsculpting® is a revolutionary, non-invasive treatment to get rid of those stubborn areas of fat that are immune to dieting and exercise. It is a FDA-approved treatment that is effective and requires minimal after-care. Coolsculpting® is based upon the science of cryolipolysis, which eliminates fat cells through cold temperature. Using a patented cooling technology developed by Harvard scientists, Coolsculpting® freezes the targeted fat beneath the skin, without injuring the overlying skin. This cooling process literally kills the fat cells, leading to their elimination and removal from the body forever. Over the course of 4-12 weeks, there is approximately a 20-25% reduction in the fat layer of the treated area. As a non-invasive procedure, Coolsculpting® does not require needles, anesthesia, or downtime after treatment. This means that you can return to your active lifestyle immediately following treatment. In addition, while some patients may have greater benefits with surgical procedures such as tumescent liposuction, patients with co-existing medical conditions or preferring non-invasive treatments may choose to purse Coolsculpting®. Good candidates for Coolsculpting® have realistic expectations, understanding that Coolsculpting® is not a weight loss treatment and does not replace a healthy lifestyle. What happens during the initial consultation for Coolsculpting? During your initial consultation, Dr. Chung will identify your concerns and take a thorough history about weight fluctuations, level of exercise, and any medical conditions. She will carefully examine the area in question, paying particular attention to the amount of fat, muscle tone, and skin elasticity. She will then map out a treatment plan for you, highlighting the number of recommended. What happens during the Coolsculpting® procedure? During the procedure, the treatment areas are mapped and marked. A gel pad is applied to the skin to protect it, and the applicator is placed over the targeted area. The skin and fat are drawn up into the applicator by a vacuum which feels like a firm pull on the skin and fat. Patients report that this pulling feels “slightly weird” or “mildly uncomfortable” but this sensation resolves after a few minutes as the cooling starts. The cooling process takes one hour. During this hour, you are positioned comfortably and you may take a nap, read a book, work on your laptop, or just relax. There are no needles, anesthesia, or pain medicine required during the treatment. At the end of the hour, the vacuum applicator is removed and a gentle massage is performed on the crystallized fat. If you are having a treatment on another area, the process is repeated and the vacuum applicator is placed on the second area. You may have several areas treated on the same day. Most patients experience no downtime. They are able to resume their normal activities immediately. Some patients report some pinkness, soreness, and tingling at the treatment sites which improves after a few days, while others may experience slight bruising from the vacuum applicator. Most patients don’t require any sort of pain medication; occasionally a patient may need to take some Tylenol or Advil after the procedure. There are no incisions to care for, and there are no restrictions on exercise or activity after treatment. With cryolipolysis, there is a slow and gradual removal of dead fat cells. Some patients may notice visible contour changes as early as 4 weeks but the maximum results are usually seen after 3 months. Your body will continue to flush out the dead fat cells for up to 6 months. Combined with regular exercise and a healthy diet, Coolsculpting® may provide you an improved look and inspire an improved outlook on life! 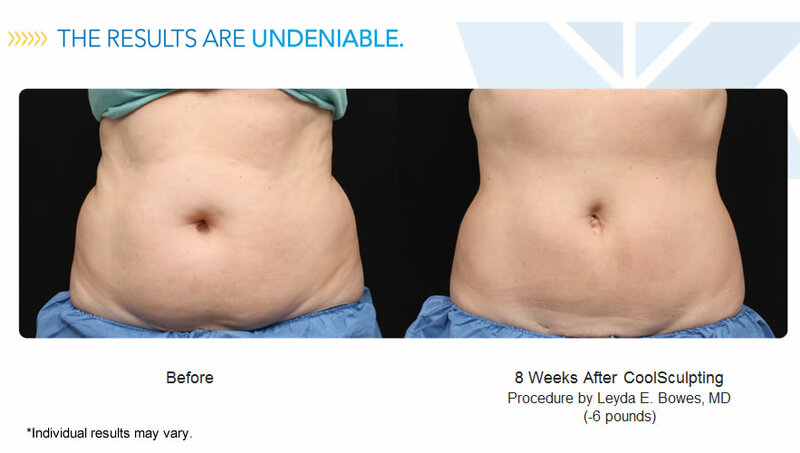 Some patients will combine tumescent liposuction with Coolsculpting® for a complete body contouring plan.